Stryker Radios - Excellent service, lowest prices, repair, warranty, tuning and fast world wide shipping on the latest Stryker radios. New in 2013. 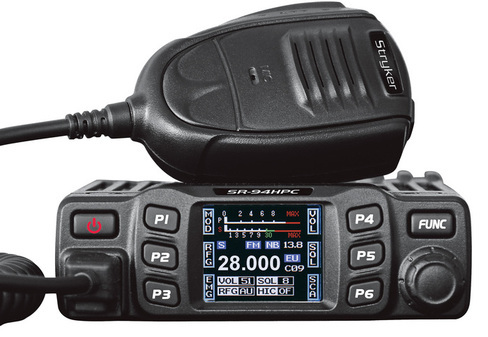 Stryker SR655HPC 10 Meter Radio. New in 2012 Stryker SR-955HP. New in 2010, SR 447 HPC Stryker Radio and SR 497 HPC Stryker radio. Stryker radios have a 2 year manufactures warranty. All of our 10 meter radios come with a factory microphone, power cord, mounting bracket and mounting hardware. This section is for Stryker 10 meter radios. For Cb radios see Cb radio in the left menu. Don't forget to add our $35 tuning. If anyone other than GI Joe's tunes or works on your Stryker radio that does void your warranty with us. Tuning includes aligning the receive, transmit, meters, any other necessary adjustments and a visual inspection of the radio. If you do encounter a problem you should contact GI Joe's first for help or instructions. On the Stryker radio "View Detail" pages you will find more information and tuning selections. Also there are options to make the Stryker radio a base by adding a 120Vac to 12Vdc power supply. The smallest power supply listed is the smallest one that will run the radio. You will only need one of the larger power supplies if you plan to run more equipment with higher current (Apmerage) demands. As there are not a lot of base radios on the market the mobile with external power supply option gives you more for your money (as compared to a base radio) and a better selection of radio features to fit your needs. **ORDERING TIP: Shipping cost per item drops substantially as you as you add more items. Example: 2 mobile radios only cost $4 to $7 more to ship than one radio. Adding an antenna with a radio often only ads $3 to $5 to the shipping cost. You can save some money on shipping by ordering everything you need at once. The more you order the less shipping you pay per item. Looking for a high power radio that's loaded with features. Introducing the Stryker SR-655HPC and New SR955HPC 10 Meter Amateur Radios. 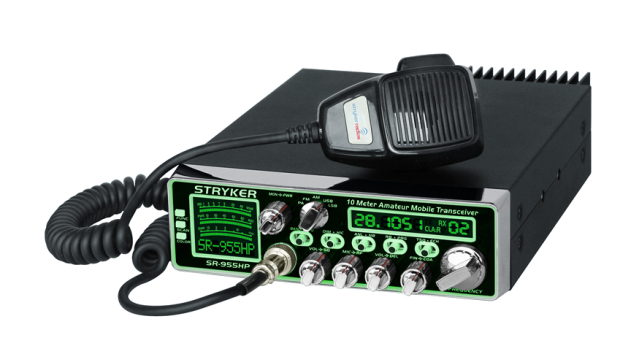 The new Stryker Radio SR655 HPC and SR-955 HPC is a next generation 10 Meter Amateur Radio that was built entirely with the operator in mind. We've loaded the radio with real world, common sense features that make using the radio a blast. Highlighted below are some of the more important features that the new stryker radios offer. *NEW heat sink design, ROUND Meter, etc. *Size (W) 6.2" (H) 1.9 "(D) 9.7" including protruding parts on depth to include knobs on front panel. New in 2013. 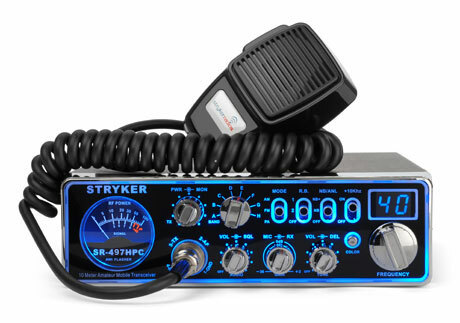 Stryker SR655HPC 10 Meter Radio. AM/FM with 70 watts output and multi colored frequency display. Available Now! See the View Detail page for a full list of features, large image and user manual. New in May 2012. Stryker SR 955 HPC 10 meter radio with AM/FM/SSB, 70w and multi colored display. The Stryker SR497HPC has one high power 2SC2290 RF power output transistor for 90 watts+ PEP output. Dual digital echo control on front panel. Variable power and variable talk-back controls. "Up-Armored" receiver for added protection against other near by high power radios and better adjacent channel (bleed-over) rejection. Stryker SR490HP 10 meter radio with echo, talk back, 125w finals, black face with backlit blue writing, blue channel LED's and meter and more. Excellent service and fast shipping. Sr 490 HP. Tuning available. The new Stryker SR447HPC has high power MOSFET RF power output transistors for 55 watts+ PEP output. Dual digital echo control on front panel. Variable power and variable talk-back controls. "Up-Armored" receiver for added protection against other near by high power radios and better (bleed-over) adjacent channel rejection.